Gentlemen, I’ve got an interesting question for you. It is is actually a two step question. Can it be done (how), and maybe more important : is it advisable !? modelling and rendering large factory layouts with thousands of files opened simultaneously. in top notch hardware, I still feel the need to improve responsiveness of this system. remains the actual 3D modelling which unfortunately remains a single thread operation. A rebuild / save operation on the highest level can take anywhere from 10 to 30 minutes. mistakes or getting jammed with so many files open). 2x 3TB sata in Raid 1 for storage. application is over kill (normal workload is between 25 and 50 GB). At the moment I’m experimentally running 3D modelling data files from a 40 GB RAM drive ! although still difficult to quantify. very rarily (only at start of opening or end of saving operation). now on this brand new system). Win7 pro 64-bit be trimmed down enough to run from RAM ? astonishing 22 GB and all programs together another 20 GB. probably be eliminated (any suggestions on cleaning / optimizing procedures ?). The main question remains: would running Win7 from a RAMdrive be advisable ? much time as the 4 times or often re-installations per year now. afford to save more often). mill system management or gaming performance for most specialist. Thanks for your time, any help will be appreciated ! My sincere excuses for the cluttered tekst. I had this text written seperately in Word, and could not get the Word or regular paste icons to function properly . I only managed to paste it as unformatted code. Booting Windows into RAM might be possible, but I haven't looked into this, sorry. Alternatives might be some enterprise system like FusionIO, ZeusRAM or the Texas Memory Systems RAMSAN products. I don't know if these are bootable. sells a technically outdated hardware Ramdisk up to 64GB, but it's over bootable SATA. bootable Flash on PCIe seems to be arriving just now to bypass SATA's IO and bandwidth limitations. (bootable) DRAM units on PCIe seems nearly non-existing. Last but not least there's SATADIMM. Can the Win7 pro 64-bit be trimmed down enough to run from RAM ? Both gentlemen, thanks for the excellent suggestions ! bblauw gave me a lot of hardware related leads to investigate. Sounds like i'm just a bit early for this topic, but that I'm not the only one looking into its possibilities ;-). This might be the safest route, since this high end CAD software is very sensitive for Windows tinkering by other applications. It is not as bad as it used to be, but it is still far safer not to install any games and as little as possible programs on serious workstations like this ;-). The Firadisk / GrubDisk menu route and links of WimB sound very promising and tempting though ! I wouldn't have to trim down Win7 that far, but anywhere under 8GB would be nice. I only hastily read through your excellent links WimB , but do I understand correctly that you still need to keep the full Win installation available on another drive for live ( automatic ? ) references of missing files or such ? Somewhere you did refer to the possibility of using this procedure on a RAM disk. By the way, you are quite welcome to use this workstation as experiment for that purpose. I have an identical sized d: disc installed only for a Norton Ghost backup of the system (so fairly safe to experiment a bit). Very tempting to immidiately be diving heads on into these very interesting matters with huge potential. I read somewhere that they start running complete network servers from multiple 256 GB RAM drives. I can see why, because this DDR-3 1866 MHz is so much faster as the fastest RevoDrives or incredibly expensive high end server SSD solutions, and relatively cheap. In my case I only need the 128 GB installed RAM sometimes at the end of some Multi week projects. I might as well put it to work in the mean time ;-). I'm very much behind on a big project, for which I need to put in a lot of hours this weekend. So tempting or not, looks like too much study and experiment material for this weekend. But I defenitely will dive in to these possibilities more in depth shortly. Thanks Guy's, I will keep you posted ! VHD_W7_Compact.exe will make Universal VHD files that can be copied and used on any system. 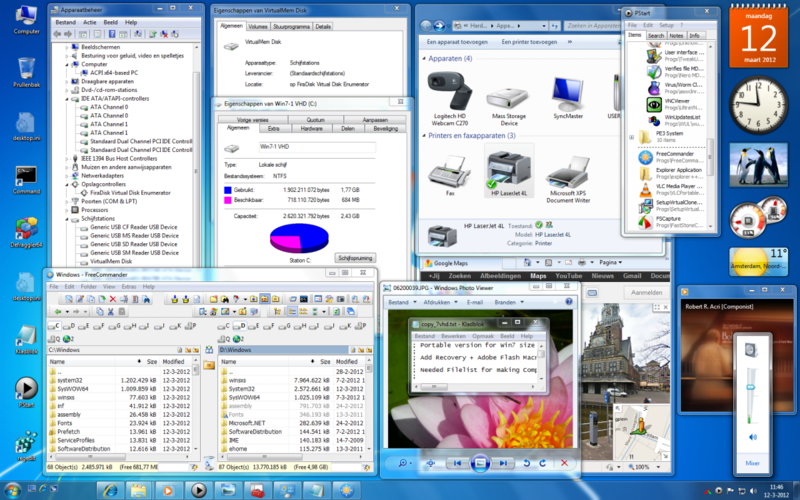 It means you can keep such VHD files in stock as spare part and in fact the computer is reduced to 1 file. In this way fast loading of RAMDISK is obtained and there are no changes needed of your System. Use UFD_FORMAT.exe to make USB-Stick bootable with Boot Manager Menu. Use UEFI_MULTI.exe to make any other HDD or USB drive bootable with the selected VHD file. which can be added then easily by using e.g. FreeCommander which has Compare and Synchronize menu. Use Grub4dos boot menu to select the VHD file which will be used to load a RAMDISK (can take few minutes). x64 Win7 is booting and running extremely fast from RAMDISK. Ok great ... I'm surely going to give this exciting possibility a try. I better allocate some serious time for this, because I have a lot of studying to catch up. But with soo much in-depth discussions and tutorials as starting point, I should be able to find enough basic info about the used applications. Thanks a lot WimB !!! My own opinion is more in line with the other posted question: Is it "worth it"? Instructions (or Data) in processor <- L1 <- L2 <- L3 <- RAM <-Paging file. Thanks sbaeder, I know you are right about the cache being poorly managed. Unfortunately my main CAD software (3D SolidWorks) doesn't run on Linux or Unix. I only ran this computer on Hyperthreading during its first day. Most of my personal working time is lost waiting for single thread rebuilt or save operations. Although in reality it bounces from one core to another, there are Always plenty cores available on 0% capacity for new threads. Nothing to be gained there, defenitely not worth the added overhead. Usually you see several cores flashing up until one hits 100% for several seconds (during which the rest comes to halt apart from some low level windows related overhead). With Hyperthreading active you can clearly see that the same happens put capped on 50%. So 39 threads are idle waiting for that 50% to finish up. I'm afraid I'm way over my head lost in Cache management. With the immense data set I work with, I fail to see what 2.5 Mb can really do. But yes I agree, the biggest problem might be the many small repeating instruction sets from the sotftware. Doubt if it can be influenced from within the software. I was hoping to put the whole application folder (4.7 GB and 12000 files) on the RAM disk, but that migh only be possible if Windows is residing on the same Disk. That is what started this search and topic. Vaguely heard something before about forcing the Paging file on a RAM disk. Looks like I need to study up on this.